Recently, one of my daily reading bloggers (kikolani.com) started her own Photostry.com digital photography blog. She inspires me to start my own too. I have a Flickr photo sharing site for a long long time, but the photos are too personal for everyone. So I decided to start a new blog that can show case what I have done and share some photos and blogs I found on the Internet. The digital photography blog is called Outography.com. The purpose of the name is to remind me and encourage everyone to get out and take more photos. So it means “I am out to the digital photography jungle”. Some of you may already seem my digital photos. Some of the photos are also used as my blog’s header images. I don’t usually retouch the photo, but I do crop to certain size or portion. It dramatically change the focus and the vision of the photos. I like to see what people see and see what people don’t see. Travel as a photographer is the life style I always dream of. You don’t have to travel very luxury, but it will be nice to travel anywhere you want without worry about your financial status. I am getting there! In 2006, my wife and I travel 7 months back-packing in China, Taiwan and Hong Kong with my Nikon D70S. That was the best time in my life. Taking thousand photos and enjoying the foods make me feel good. Too bad, the 2 years travel plan end up short because of my teeth infection. The following images are cropped for my blog header image. They will be randomly picked on every page you see on this site. I will be adding more from time to time. I also added some information about the photos. So enjoy and let me know if you like it or not! Image Source: YiLan, Taiwan by Me – This image has been enhanced! Thanks to my brother. He took me to the wonderful place in YiLan Taiwan. While I am traveling in Taiwan for Chinese New Year, he is very kindly took me to the mountain. The forest in YiLan is very beautiful. The air is breath taking. It’s so fresh that you can smell the pine tree. There is no doubt that breath the fresh air makes me happy. The only thing that is not perfect is a missing person. I wish my wife were here with me to enjoy the raining afternoon. It is very uncommon to see the rain like this in the hot sunny Arizona. Image Source: Playing with some coloured pencils – This image has been enhanced. [UPDATE] To focus more on the topic about entrepreneur, I have moved the Blog Post Header Image – Collection 3 to My Photo Blog. 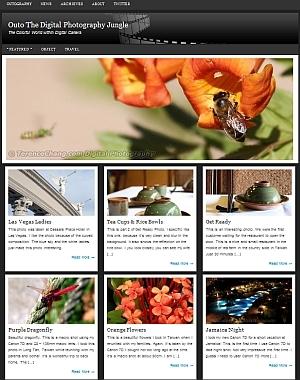 You can also visit the completed header image collections. Continuing my monthly effort to list the photos that I used in my blog posts, here are more photos. Enjoy and remember to read my blog post. You can see my first blog post header image collection from the following link. Or visit my Photography page for the collections. If you like what you see, please help me to spread the world to your friends. Image Source: Noche de luna llena…Full moon night – This image has been chopped and retouched. After I post “Does your blog make lemonade? Make your blog interesting with header images“, I have been using post header images on almost every posts on this blog. I believe that an interesting blog header image will give the post some nice vivid touch. It also gives the reader a better idea about the post. All of the images I used in my posts are either licensed by Flickr.com or taken by me. I include all those third party photos under my favorites page. In many cases, I modify the images and make them look even more interesting. I love photoshop, the best photo editing tool available in the digital world. I used a lot of tricks to enhance the photos, including retouching, burning, erasing unwanted spot, rearranging the objects in the photo, adjusting the contrast, adjusting brightness, setting auto color, setting auto level and many other modifications. I will start a series of photo collections every month to list the images that I used in my blog post. This will give my reader a greater idea what my photography taste is. So enjoy the photos and remember to read my posts! Can you describe 7000 photos in one word? Can you use one word to describe 7000 photos? I know I can’t. I have spent few days put up some of my travel photos on flickr.com. I just realize that uploading almost 7000 photos is not an easy job. I have been asked by many blog friends about me and my life. I have traveled a lot of place. I still have a lot of places to visit. I just hope to travel around the entire world before the end of my life. Now. If you are still interested in who I am, how I look like and where I have been, you can simply visit my flick.com photo pages. Do I look like a millionaire?